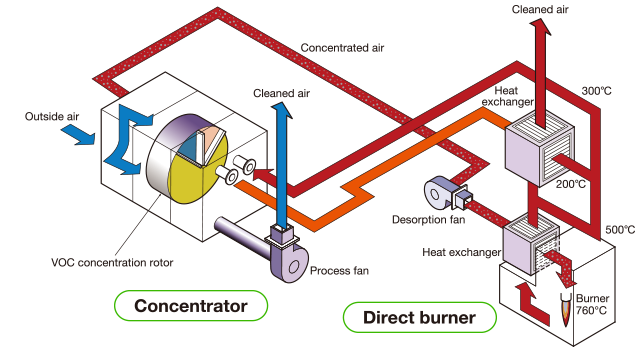 A system that allows for periodical desorption operation at 300°C (high temperature desorption operation) to desorb accumulated substances with high boiling points and prolong the life of the rotor. The sealing material which is compatible with temperature upto 300°C is a mechanism that is unique to Nichias. Applications: Exhaust gases from semiconductor and LCD production lines, photogravure print drying , and chemical production etc. This system is for eliminating organic matter that has accumulated on the concentration rotor, and it will not restore the rotor to its original state. It is highly recommended that a mist filter (activated carbon etc.) be installed at the stage prior to the concentration rotor. If substances with boiling points of greater than 300°C are included, they cannot be removed. Also, this system cannot remove all substances with boiling points at or below 300°C. Depending on conditions, there are cases where this system should not be applied, such as high volumes of substances with high boiling points etc.. The desorption outlet temperature can be upto about 250°C, therefore it is necessary to select ducts, sealing materials, and fans that are suitable for that temperature.